Thanks for all this detailed and serious analysis. I was looking for a camera to upgrade from a smartphone. Smartphone digital manipulation is quite impressive these days but all my travel photos still look bad if I print them or look at them cropped. So good landscape compositions remain for uploading to social media and that’s it. You solved a big dillema for me. Based on your recommendations I ordered the zs100, although it may be a little less good at night/night sky shots than shorter brighter lens options, hopefully it will be a good buy. As a larger camera with interchangeable lenses, Olympus E-M10 mark ii has a larger sensor (Micro four thirds, 16 megapixel) and will likely capture cleaner, sharper images, especially in dim light (testing indicates about 1.5 stops less noise in terms of ISO, noticeable at ISO 800+) than Sony RX100 iii. But in bright light at base ISO, you won’t see a big difference using the kit lens, and RX100 is much more portable. The E-M10 will be a bit sharper and crisp when using the best lenses, as shown in the handy Comparometer at http://www.imaging-resource.com/cameras/sony/rx100-iii/vs/olympus/e-m1-ii/ which shows results using a pricey Olympus Zuiko Digital ED 50mm F2.0 Macro lens, but that is significantly sharper than the kit lens. If you want an interchangeable lens system, in all my comparisons, Olympus and other 4/3 sensor systems still don’t pay off compared to Sony APS-C A6000/A6300/A6500 series in terms of image quality, price value, portability, and light weight. For the most versatile pocket camera, I’ve moved away from Sony RX100 series and now prefer the more versatile 10x Panasonic ZS100 and 15x successor ZS200. Hi Tom, I’m looking to upgrade from my Panasonic TZ80 to something with a bigger sensor. I like my travel photography, mainly landscape and wildlife. I’ve been looking towards mirrorless options such as the Panasonic GX80, but not sure if I want to go for the changeable lenses, or should instead go for an interim step via a bridge with a 1″ sensor- I’m very taken by the fantastic zoom options on the compacts and bridges, whilst there’s no way my budget could stretch to equivalent lenses. Any thoughts/recommendations? Your current Panasonic Lumix DMC-TZ80 (called Lumix DMC-ZS60 in USA) weighs about 10 oz and has a 1/2.3″ sensor. The Panasonic Lumix DMC-GX80 (Lumix DMC-GX85 / Lumix DMC-GX7 Mark II, read review at dpreview.com) weighs 15 oz plus the weight of interchangeable lenses, and has a Four Thirds sensor. But if you are going the route of interchangeable lenses like the GX80, for that weight and expense class, you get more for your money and a much larger sensor, APS-C, if you go with a Sony A6300 or A6500, which have similar system weight, better quality images (24 MP vs measly 16 MP), better viewfinder, excellent hybrid focus system, longer battery life (400 versus 290 shots per charge). 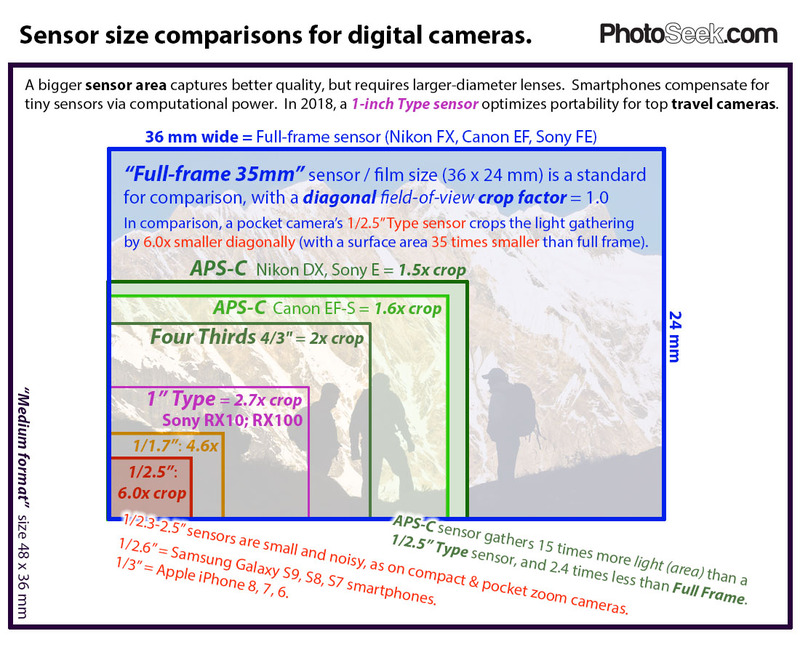 That being said, I discovered last year that Sony RX10 III (with 1″ sensor) easily beats Sony A6300 (APS-C) with 11x zoom lens as described in my RX10 article on PhotoSeek, due to sharper, faster lens combined with newly advanced BSI sensor design. 1. Midsize camera, older price value with 1″-Type BSI sensor: Panasonic FZ1000 (2014, 29 oz with 16x zoom lens 25-400mm equiv, 20mp). 2. Pocketable model: Panasonic Lumix Lumix DMC-TZ100 in UK (DSC-ZS100 in USA) (2016, 11 oz, 25-250mm equivalent lens) outguns all pocketable 1″-sensor rivals with a versatile 10x zoom (read my ZS100 review). Good question! Panasonic FZ200 and FZ300 use a tiny 1/2.3” sensor which can struggle in dim light and can limit the size of large sharp prints. This may not be a problem if you are happy with your current print size & image quality. A skilled photographer can compensate for small-sensor camera limitations to create evocative images. Most viewers aren’t concerned how an image was captured, unless they are photographers who like the latest gear, but even the most skilled photographers will be hard pressed to distinguish which type of camera shot an image (without being told). I regularly publish images from a variety of cameras. Today’s 1″ sensor cameras beat the enlargement quality of my 35mm film cameras used through 2004 (when I switched to digital). Check out the pixel comparison tool at dpreview.com comparing the above cameras. Click around the tool’s image to examine especially the corners, and look at quality at common dim light ISO settings such as ISO 800+ or other settings you commonly use. This tool only shows one lens angle of view, but not telephoto, which is another story not often reported on testing websites (so I like to test my new cameras head to head). 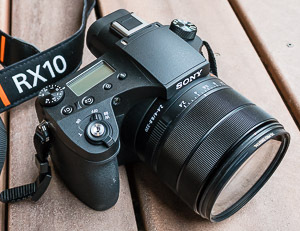 Sony RX10 III is especially good in my telephoto tests against a larger-sensor flagship camera. With its larger, higher-quality sensor, it turns out that an image from the FZ1000 at 400mm can be cropped to beat the framing of the same subject shot on FZ300 at 600mm. The best combination of sensor size, increased megapixels, and good glass is found in Sony RX10 III. But if you want to save weight, the FZ1000 is a great camera value, generally superior to FZ300 or FZ200, depending upon what you’re looking for. Tom, Thank you for the quick response. I think I’m more confused than ever lol. I always have a difficult time deciding what to buy. On paper the A77ii seemed like the perfect camera for me aside from the bulk but I have not really gotten consistent results. I’m sure much to user error and lack of knowledge. It just seems my shots are often just out of focus. I bought a 2.8 70-200 Sony zoom, a Sony 50mm prime and the camera came with the 16-50mm 2.8 lens so I don’t think it’s a matter of having good lenses. Sorry for rambling. I guess my question is what do you think of the A77ii? Is the Sony RX10 III a worthy replacement or should I go to the A99 full sensor and just stick with a smaller super zoom like the FZ300 for a smaller lighter travel camera. So confused. Thanks for taking the time to maintain a useful website and answering ridiculous emails. We’re actually in a golden age of cameras, with a confounding myriad of confusing choices! After 39 years of photography, I’ve found what gear works best for publishable quality while traveling light. The Sony SLT-A77ii is an excellent camera, faster focusing and almost as sharp in resolutioin as my Sony A6300 mirrorless camera (according to the standard test shots at dpreview.com). A77ii should be much sharper than Panasonic FZ200 or FZ300, especially at ISO 800 and higher, especially with your excellent f/2.8 lenses. But for general travel photography, I’ve now given up on my Sony A6300 system, as the all-in-one Sony RX10 III easily antiquates the Sony E-mount lens system in terms of lightweight travel, as described in my article: Sony RX10 III superb 25x travel zoom outshines 11x on APS-C. The A6300 is now relegated to my indoor event photography or night shots on tripod, as the larger sensor should theoretically be better in low light if I use a top lens. By the way, the problems you mentioned with focus on A77ii can be due to various causes, such as shallow depth of field, handheld blur due to slow shutter speed, etc — most likely a learning opportunity (smile) [unless your camera is damaged, in which case every shot would likely be out of focus]. Cameras by default hunt across multiple possible focus points, usually looking for the closest, brightest, most contrasty area, which is often not the subject you wanted to focus on. For more reliable focus in landscape or macro photography, I prefer to set a single focus point in the center (not using Continuous focus, just Single). I half press the shutter release to lock focus on a defined edge of the subject, recompose, then fully press the shutter release. Or for people photography, I turn on Sony’s excellent Eye-Detection AF (or Face-Detection) and use a wider focus selection area with multiple possible focus points. If the A77ii isn’t working well for you, a pricey A99 wouldn’t necessarily change your results, as the full-frame-sensor A99 has even shallower depth of field, good for traditional portrait photography, but your chosen focusing point must be more precise (due to the physics of the larger sensor). You may possibly find that Panasonic FZ200 and FZ300 are much easier and more fun to use than A77ii or A99 for certain tasks, such as lightweight travel. DSLR designs are generally harder to learn and use. Although its camera menus are harder to learn than Panasonic’s, the Sony RX10 III is currently the best-ever tool for my travel photography, beating any other current system that I’m aware of (full-frame, APS-C, 1” sensor etc), in terms of excellent publishable quality for a given travel weight & convenience. You would need to swap a lens system at least 2 or 3 times heavier on a bulkier larger-sensor camera to beat RX10III’s superbly sharp 24-600mm equivalent f/2.4-4 lens in a 37-ounce box. Happy photo hunting! What kind of advice is that? Just because you have decided that it is right for you does not mean that it is the right thing for everyone. DIfferent photographers have different needs. It is exactly what the manufacturer’s want us to do. Make us dis-satisfied with perfectly good equipment. CHURN, Churn, churn. Profits for them, money we could have put to better use gone, a re-learning process to go through. There is probably even more expense on a new de-mosaicer, and a new computer to run the later version of the OS that it requires, and extra disk for the larger files. And for what? … in most cases to carry on producing exactly what we produced before. The extra “quality” often turns out to be irrelevant. At low-ISO, in good light, and with good technique it is hard to tell an image from a current camera from one made with a 10+ year old DSLR. … “upgrading” is pointless if the camera you have, in the way that you use it, produces images as good as necessary, for whatever you want to do with them! I agree that skilled photographers can work around the limitations of older cameras (or less-capable sensors) to get results that are usually indistinguishable from newer, superior cameras (especially if you don’t need large, sharp prints). I have felt this way since starting shooting film in 1978. My advice in the article is still true if you include the whole sentence: “TIP: Upgrade your camera every 2 or 3 years as I do to get better real resolution, lower noise at higher ISO speeds ( ≥ 800), and quicker autofocus.” I say this entirely for your own self interest, independent of what the manufacturers want. In teaching local photographers (many who have gear older than 5 years and don’t necessarily want to change), I advise them to master their current camera and workflow, which can get perfectly good results, once they ascend far enough along their learning curve. The learning curve on a new, unfamiliar workflow can sometimes be a barrier, such that many would be better off learning their current system. But with gear older than 5 years old, I notice my students fighting a steeper uphill battle with poor results on Auto, poorer-performing sensors, low effective resolution, poor dynamic range, poor image stabilization, and slow autofocus. In many cases, their learning curve towards better photography could be eased by upgrading the camera (or by using their modern smartphone made 2015-2017 with excellent HDR Auto, making photography much user-friendlier for capturing more realistic shadows and highlights by default). Thanks for your thorough and thoughtful review on travel cameras. I’m wondering why Olympus’s OM-D or PEN cameras did not make your list. They seem to be well-received by other reviewers. Tom replied: Good question. By the way, from 1978−97, I used and loved an Olympus OM-1N film camera; and recently I bought Olympus Tough TG-4 (price at Amazon) for snorkeling shots in Hawaii. Olympus’s OM-D and PEN cameras are excellent quality and can certainly capture good images. However, comparing portable travel size, weight, image quality, zoom range and price, you get a better deal with an 11x zoom travel lens on a Sony A6000, A6300, or A6500, which all have a 24-megapixel APS-C size sensor, 50% bigger in physical surface area than the 4/3 sensor in Olympus OM-D or PEN (which have only captured 16 megapixels until 2016, when 20mp were introduced in Olympus OM-D E-M1 Mark II and PEN F; probably the same sensor as in Panasonic Lumix DMC-GX8). Now with the Sony RX10 III (read my article) new in May 2016, my zoom range has more than doubled to 25x while maintaining equal or better image quality, a rather surprising result for a 1” type sensor (smaller than Micro Four Thirds or APS-C). This improvement is possible due to new superior BSI sensor design, plus fast lens (f2.4-4, 24-600mm equiv) with notably large light-gathering diameter (72mm) and very sharp optics. Quentin replied: Thanks for your prompt and personalized reply! The main problem with the “bridge” cameras is their bulkiness compared to the compacts and even the Oly 4/3. Always choices to make! – I admire the Samsung NX1’s superb image quality, fantastic for both 4K video and also 28mp stills with great dynamic range, one of the best-ever APS-C-size-sensor mirrorless cameras! But for me, Samsung NX1 is rather heavy for a travel camera, with body alone weighing 19.4 oz (including battery). NX1’s lens choices are limited but include some real winners, such as the sharp but heavy 21-oz weather-sealed 16-50mm f/2-2.8mm lens. Samsung has widely marketed their successful NX1 camera business and I would be surprised to see it cease in the USA [see http://www.imaging-resource.com/news/2015/09/23/rumor-busted-samsung-is-not-exiting-the-camera-business-at-least-not-the-on]; but as of Nov 26, 2015 Samsung has closed their camera business in UK and Germany. — Panasonic GX8 (2015, 17.1 oz body, 20mp, but no built-in flash) is a great choice for 4k video, as is the earlier GH4 (2014, 20 oz body, 16mp). — Handy for framing rapidly-varying travel subjects, the Panasonic Lumix G Vario HD 14-140mm f/4.0-5.8 ASPH/MEGA OIS lens (16 oz, 28-280mm equivalent) rivals the optical quality of competing 10x to 11x zooms, even compared to APS-C.
— Panasonic FZ1000 (2014, 29 oz includes a versatile 25-400mm 16x travel lens, 20 mp). — The best-ever pocket-sized camera now shoots great 4k video: Sony RX100 version IV (2015, 10.5 oz, 20mp with fast 24-70mm lens, with good pop-up EVF/viewfinder). Essential for video, the following cameras fully articulate their LCD screen: Panasonic GX8, GH4, and FZ1000. The others only tilt their LCD (Samsung NX1, Sony RX100 IV). All of the above 4k-video cameras support the UHD 4k standard with 16:9 proportion for 4k televisions (3840×2160 pixels, displayed progressively at 2160p) (Ultra High Definition or UHD can also be called “QuadHD” for having 4 times more screen pixels than “Full HD” 1080p resolution). But only NX1 and GH4 support the DCI 4k standard for commercial cinema projection (4096×2160 pixels, 17:9 proportion). Olympus Tough TG-4 (2015, 8.7 oz, 25-100mm equiv 4x zoom). For weather and dust protection, I always keep cameras covered in a front pouch for easy access. During adverse fluctuations of temperature and humidity or near the sea or in dusty conditions, I double-protect the camera in a zip-lock plastic bag inside the padded pouch (thus avoiding the extra expense of a weather-sealed body and lens). Related story: After 11 months of owning the great Sony RX100 version I, I noticed some dust spots in portions of shots having uniform blue sky — and a test shot of uniform blue sky confirmed the problem of dust on the sensor. I sent the camera back to Sony under the 1-year warrantee, and they cleaned the sensor for me for free! Compact camera customers have no allowed way to access the sensor, so it was really nice that Sony cleaned it under warrantee. Note that the Sony RX100 is much pricier than the Panasonic ZS40 or ZS50. Based upon this story (and your reminder from dusty Africa), I will periodically check for dust more often on all cameras, especially compact cameras like my current Sony RX100 version III (which is unsealed). I will be more vigilant in dusty areas to protect the camera, such as double-bagged when not in immediate use. Tom replies: Requiring weather sealing along with a big zoom telephoto range tends to increase camera size, or else requires reducing the sensor size at the cost of noisier images and poorer performance in dim light (as in the Olympus TG-4). 4. Panasonic FZ300 (2015), 12 MP, 1/2.3” sensor, 25 – 600mm f2.8 lens, 24.4 oz/691 g — best bang-for-the-buck in this list. 6. Olympus TG-4, 16 MP, 1/2.3″ BSI-CMOS Sensor, 25–100 mm Lens, 247 g — the only pocket-sized camera of these six. Hi Tom, In your opinion which will produce a better travelling landscape photograph. Sony RX100 III or Alpha 6000? With its sensor being 3 times larger in light-gathering surface area, the 24mp Sony Alpha A6000 will generally capture landscape image quality superior to the 20mp Sony RX100 III, when shot at subject focusing distances of at least 2 feet (60 cm) to infinity. But at close focusing distances, such as 4 inches for flower macro photos, RX100 generally captures superior images (unless you mount a specialized macro lens on A6000 to focus closer than its typical lenses). The smaller size of RX100 makes it easier to carry for travel convenience, such as in a shirt pocket — to help ensure you always carry a camera and never miss a shot. Because the two cameras have different strengths, I travel with both! If one breaks accidentally, the other serves as backup. What is the best 30x zoom travel camera among the following. Among those three cameras, Sony HS 60V has superior 20mp sensor resolution and battery life; otherwise it’s similar to Nikon S9700 and Canon SX700 IS. Sony A6000 still has my vote for best all-around travel camera. The A6000 has a sensor 3 times bigger in light-gathering area than the 1-inch sensor found in Panasonic FZ1000, and 8 times bigger than found in Panasonic LX7. For better low-light performance, a physically bigger sensor is generally superior. In low light, you can also use Sony’s “Handheld Twilight Mode” (in Sony NEX, A6000, and RX100) to automatically combine multiple shots into one sharper shot (JPEG output only, not RAW). By the way, tiny cameras such as in Apple iPhone 5S smartphone similarly combine several photos automatically to increase image quality & sharpness in low light, at slow shutter speeds (1/15th second or faster), and for high dynamic range (HDR). iPhone’s HDR option (set AUTO or ON) nicely brings out shadow detail while preserving highlights, but should be turned off if you want a high-contrast image. The iPhone 5S tiny sensor can be comparatively noisy/blotchy in low light, being 21 times smaller in area than APS-C sensor. – 29 ounces or 831g weight, with battery. … FZ1000 may be sharper at 400mm telephoto than cropping Sony’s 18-200mm lens (27-300mm equivalent) on Sony A6000, especially sharper around the edges of images, except at high ISO, where the larger sensor is expected to look better. … By the way, when judged by actual hole size or “equivalent F stop” (which controls shallowest depth of field), the FZ1000’s brightest F stop is not as bright as the 18-200mm lens on A6000. Just a comment about the D3200: I used to own the D3200, which under ideal conditions was amazing, but it really needed clear, sunny, days to shine, or the noise ate up all the details (just as it is with the 1″ cameras)! I bought a D600 instead… An amazingly much better camera, not least in low light! Fantastic website, thank you. I have a Canon 60D but am finding it plus a couple of lenses pretty heavy to handle on my travels (mostly involving trekking). The NEX-6/7 gets a great rap from you and I am really interested in it but am wondering how it goes in lousy weather. I note that the Olympus OM-D E-M5 is weather-sealed but your reviews seem to favor the NEX significantly over the Olympus. Is that the case and how do you protect the NEX from rain/dust etc? I agree that Canon 60D is a bit on the heavy side for trekking, which motivates use of a lightweight NEX-6/7 (upgraded to A6000 in 2014) with great APS-C sensor. I keep my camera safely in a front pouch on a chest harness for easy access: my NEX-7 camera and 18-200mm lens fit nicely in a Lowepro Toploader Zoom 50 AW Bag. In waterfall spray or rain, I take the camera out of the pouch quickly, take a shot, wipe all parts of the lens & body with a silk cloth, and quickly protect the camera under cover again. (A partner with an umbrella is better if possible.) After a few shots, I stop risking the camera and wait for drier conditions, or use a smaller Sony RX100 (buy at Amazon) which is easier to keep dry under a big hat brim and quickly tucked into a pocket. In rain, frequent water drops on lens and flat light usually motivate me to wait for better weather. If you can afford it, the Olympus OM-D E-M5 is a great quality camera, especially if you find weather sealing desirable. (I loved the reliable, unsealed Olympus OM-1N as my main camera from 1978–1997!) But few Olympus lenses come weather sealed, and its Micro Four Thirds sensor captures a stop less dynamic range than APS-C, limiting crucial highlight and shadow recovery from RAW files. Bodies are easier to protect from rain than lenses. Risk of unsealed lenses fogging inside is the biggest issue, solved by pumping it in and out in a dry environment as soon as possible. Over 30 years of shooting mostly in temperate climates, I’ve never needed a sealed camera — except where snorkeling/rafting/kayaking sports required an underwater compact camera (also good against dust or rain). Weather-sealing may only pay off if you spend a lot of time in extremely cold, wet, or dusty conditions. The possible longer life of expensive sealed cameras doesn’t attract me due to great upgrades coming every three years for cheaper unsealed cameras. Your extended trip sounds fun, covering every possible climate. Your long list of desired features cannot be met by any one camera, but points towards a short list of cameras with APS-C sized sensor, the best currently being: Sony NEX-6 or NEX-7 with Sony (SEL18200) 18-200mm lens (read my complete article). As with Nikon DSLR cameras, Sony NEX menus are poorly designed, but are only a minor hindrance, once the camera is set. Canon and Panasonic have more intuitive, direct menus, but cannot match Sony NEX-7’s 24-mp image quality combined with great features in a 33-oz system with 11x zoom lens. Although cheap memory cards make big files no problem, processing a lot of 24mp RAW files may require upgrading to a powerful new computer. If that’s an issue, get a 16mp NEX-6, which autofocuses faster. Night photography usually works best around ISO 200 to 800 on a tripod. If you are really into low-light or night photography, you might consider a bulky full-frame sensor camera, which is especially great for indoor high-ISO work in dim light without flash. But my NEX-7 successfully shot an indoor theater production handheld without flash at ISO 6400, making a client happy! If you want to beat a NEX-7 with faster autofocus speed and weather-sealed body, consider a top DSLR: Sony Alpha SLT-A77 Digital Camera. But this adds an extra 11 ounces in the body plus significantly extra weight if lenses are added beyond the 18-200mm. You can increase autofocus speed on NEX-7 to match an A77 by adding a 7-ounce A-Mount lens adaptor for use with a broad catalog of Sony lenses. But an extra lens such as 70-300mm for wildlife adds 28 ounces. I’m happy with just one lens, the 19-oz Sony 18-200mm (which by the way is a bit fuzzy for shooting macro). For excellent macro and a backup camera, I add the amazing pocket-sized 8.5-oz Sony DSC-RX100. Hi Tom, What’s your view on the latest Fujifilm X-E1? – NEX-7 is 2 oz heavier, whereas NEX-6 is same weight as X-E1. Fujifilm X-E1 seems about on par with image quality of a Sony NEX-6, but NEX-6 may autofocus faster. I like the retro appearance and handy external controls on Fujifilm X-E1, although the exposure compensation dial is too easy to bump and rotate by accident (fixed by applying tape). Fujifilm’s attractive 18-55mm F2.8-4 lens (11 oz) significantly beats the optical quality of Sony’s E-mount 18-55mm F3.5-5.6 OSS lens (7-oz). But I prefer carrying a sharp Sony 18-200mm lens for travel. Unfortunately, Fujifilm X-mount offers no 18-200mm lens, thus requiring frequent lens-swapping, which is inconvenient for capturing action and rapidly-changing travel subjects. A limited number of native lenses exist for the X-E1, such as: 55-200mm F3.5-4.8 OIS, XF 14mm F2.8 R , 18mm F2, 35mm F1.4, and 60mm F2.4 macro. X-E1 adaptors support Leica M, Nikon F, Pentax K lenses, but adapting onto X-mount restricts you to manual focus (NO autofocus) and manual aperture control. How about Sigma compact cameras with innovative Foveon sensor? Sigma DP2 Merrill has too many fundamental flaws for me to consider for a travel camera. Compared to the above cameras, the slight advantage in sharpness of a DP2 (with excellent-quality fixed-focal-length lens, 45mm equivalent) is far outweighed by negatives: exceptionally poor battery life, poor low light performance and noise above ISO 400, no zoom, no stabilization, no EVF, no flash, and slow buffer writes disable image review too long. Among cameras in the size of a Sigma DP2, better value is found with a Sony RX100, NEX-6, or NEX-7. What do I think of Panasonic and Olympus? A Panasonic G3 or G5 would be a better choice than GH3 for excellent portability, money value, and sharp results. The Panasonic GH3 body is unfortunately 7 ounces heavier (and much bulkier) than the Panasonic G3. I would have little use for the GH3’s weather sealing and enhanced movie features compared to the G3 or G5. I don’t find weather sealing very important as my cameras are protected in a chest-mounted bag as I hike the dusty or drizzly trail. The Olympus OM-D is very sharp and attractive but the 4/3 sensor limits ISO sensitivity and dynamic range, and I don’t really need weather sealing. Camera sealing and longevity are a minor issue because I upgrade to the next leap in technology after 3 years and sell the old camera while it still retains value. In all cameras from large to compact, I favor zoom cameras over ones with a fixed lens for travel. Why? Zooming a typical telephoto 2x or more beyond an excellent fixed lens beats any sharpness advantage when digitally cropping the fixed lens is required to frame the desired subject. Zooms frame subjects more flexibly than fixed lenses without the extra bulk and annoyance of swapping lenses. Regarding lenses, Steve said “I think I am most surprised by your comment about the general sharpness of the Sony 18-200 zoom over that of the Zeiss 24!”: [Tom’s answer revised in 2014:] In SLRGear.com’s Blur Index Tests done on a 16mp NEX-5 in 2011, the 50mm and 24mm Sony prime lenses don’t have a striking advantage over using the SEL-18200 lens; but later tests at dxomark.com in 2013 indicate clear advantages of using these prime lenses on a 24mp NEX-7. Improving sensor resolution from 16mp (as in NEX-5 or NEX-6) to 24mp (NEX-7 or A6000) apparently makes prime lenses more valuable! Note that a Sony Zeiss 24mm lens has 2.3 stops brighter aperture and is 1.4 inches shorter, but the 18-200mm lens is more versatile and has Optical SteadyShot (OSS) for sharpening hand-held shots at slow 1/10 sec shutter speeds. SLRGear.com’s 2011 Blur Index test details on 16mp NEX-5 are as follows: Surprisingly, Sony’s 18-200mm OSS lens is sharper at most apertures (except softer in the corners at f/4) than a prime Sony 24mm f/1.8 E-mount Carl Zeiss Sonnar (8 oz, SEL24F18Z) lens when used on a 16mp NEX-5. When compared to Sony’s 18-200mm lens set at 18mm and 35mm, Sony’s 24mm Zeiss lens is blurrier from f/8 through f/22 (and the 24mm’s softness at f/1.8 to f/2 resembles its f/12) on the 16mp camera. While its brighter optics from f/1.8-2.8 let you shoot in lower light and defocus the background, its fixed angle of view is too wide for optimal portraits. Note that real world lens use often makes lab testing moot. I’m looking for a lighter weight camera for travel than my Nikon D700 or D300s with 2.8 lenses. My priorities are less weight, auto focusing, and low-light shooting. I have been looking at the Panasonic G5 or GH3 but am concerned about auto focusing and focus tracking limitations. What system would you suggest for our upcoming trip to Burma? A Panasonic DMC-G5 camera (14 oz body, 2012) would be great for foreign travel — a wonderful camera in a portable body, great with the sharp and fast-focusing Panasonic Lumix G Vario HD 14-140mm f/4.0-5.8 ASPH./MEGA O.I.S. lens (16 oz, 28-280mm equiv). The GH3 is heavier and larger, so saving money on an older, smaller GH2 may be better for travel. The new Sony NEX-6 introduces hybrid autofocus, with continuous tracking faster than previous mirrorless cameras, potentially beating Panasonic G5, GH3, GH2, and Sony NEX-7. Most mirrorless compact cameras have had slow tracking during continuous autofocus mode due to use of contrast detection (instead of phase detection autofocus found on DSLR/mirror cameras). But in their favor, mirrorless cameras such as Panasonic G Series easily beat the autofocus capabilities in video/movies and Live View stills compared to most DSLRs (except for Sony Alpha SLT models with translucent mirrors which are fastest all around). Coming soon, look for more compact cameras with hybrid autofocus where sensor pixels are devoted to phase detection autofocus in addition to contrast detection. By the way, except for birds and fast action, I rarely use problematic tracking features and instead rely on my own timing. 4/3 type sensor cameras like Panasonic G5 or GH3 have about a 1-2 stop worse noise difference in terms of ISO compared to APS-C size sensors at ISO 1600 and higher. I prefer larger APS-C sensor for less noise at high ISO. I recently photographed an indoor theater production at ISO 6400 on the amazing 24-megapixel Sony Alpha NEX-7 camera with versatile Sony E-mount 18-200mm f3.5-6.3 OSS lens, which worked great for the Drama School customer. Sony Alpha NEX-6 camera (12 oz body + 4 oz Retractable lens, 2012) should focus even faster with its new hybrid autofocus. Hi. I found your website very informative and I was really impressed by the Sony Nex7 or Olympus OM-D EM5. However, I was abit taken aback by the price tag in the $900 range to include the lense kit. Recently, The Pentax Q10 was launched and with almost half the price of the earlier two aforementioned. I know there is a difference in specs. But, what’s your take on the machine? The pocket-sized Pentax Q10 (2012) will be a fun novelty to own as the world’s smallest interchangeable-lens camera, but charges a price premium for the privilege. You get much more for your money and a 4 times bigger sensor area with an 8.5-oz Sony DSC-RX100. (Cheaper cameras such as Panasonic GF3, GF5, and pricier GF5X also easily beat the Q10 with their 4/3 inch sensor.) In comparison, Pentax Q10 has a tiny 1/2.3″ sensor (which limits print size, requires bright light), autofocuses slowly, and doesn’t capture action well. Pentax Q10 with 5-15mm Lens (27.5-83mm equivalent) is priced slightly less than Sony RX100 but performs much more poorly. Pentax Q10 camera features: Weight is 10.4 ounces (7 oz body with battery plus 3.4 oz 5-15mm lens, Pentax Q mount). It has raw file support, tiny but effective buttons, sensor-shift image stabilization, CIPA battery life of 270 shots. Body size is 3.9 x 2.3 x 1.2 inches (98 x 58 x 31 mm). At high ISO the Q10 surprisingly gets lower noise than a Canon PowerShot G12 (which has larger sensor, 1/1.7” type), but Canon S95 and S100 are still a better value. Despite its little sensor, a Q10 can make great 16×20-inch prints from ISO 125-400 and ISO 1600 makes a good 8×10 when shot at aperture f/2.8 (but diffraction makes images much fuzzier through smaller openings, such as f/5.6). An innovative flash pops high to the side to avoid red-eye or can fire in place. Without a practical viewfinder, you’re left with a good 3″ LCD with 460,000 dots. (Its optional rangefinder-style optical viewfinder adds $250 and impractically blocks the flash from popping up.) Lack of dedicated movie button hinders starting a video recording. Hi.. Great article. I am also off traveling to Australia and around Asia for over 12 months. I am a professional photographer and I want a camera up for the job of being able to produce nice images in a small, manual package. I’m very drawn to and almost certain I want to take the Fuji X100. What’s your thoughts on this camera for travel photography whilst backpacking? 1) Sony Alpha NEX-6 with 16-50mm Retractable Zoom lens (2012, 12 oz body + 4 oz lens 24-75mm equiv, 16mp APS-C sensor) (which saves $350 and 2 oz of body weight compared to my 24mp NEX-7). 2) Or, get a slightly larger retro-looking camera with interchangeable lenses: Olympus OM-D E-M5 Micro Four Thirds Camera (2012, 15 oz weather sealed body, great viewfinder) with splash-proof M.ZUIKO DIGITAL ED 12-50mm f/3.5-6.3 EZ lens (24-100mm equiv, 7.5 oz, splendid video, macro down to 36×27 mm). 3) Or, for lighter weight backpacking or general travel, get the best shirt-pocket-sized camera of 2012: Sony DSC-RX100 (8.5 oz, 28-100mm equiv lens, f/1.8-4.9, 20mp 1″ sensor, unusually quick autofocus 0.15 sec, sharp LCD, but no viewfinder). It easily beats my old 2004 Canon PowerShot Pro1 in both sensor size and miniaturization. – Think twice before getting a Fujifilm X100 (12mp APS-C sensor) and maybe consider the next version Fujifilm FinePix X100S (16mp) which adds fast phase-detection autofocus, fixes numerous problems, and improves EVF, menus, and manual focus. The earlier Fujifilm FinePix X100 not only charges a price premium for retro look-and-feel but also performs slowly compared to competitors (above). X100 problems: It has slow RAW write times and inability to manually focus or change the ISO or AF point while it’s writing to card. X100 autofocuses slower than competitors and manually focuses (by wire) unresponsively. Important Auto ISO and flash exposure compensation options are deeply buried in poorly organized menus. Continuous drive mode switches to a different file-naming convention, creating confusion. Advantages include an excellent viewfinder (hybrid between optical and EVF), good image quality, good at high ISO, in a portable body+lens combination of 16 oz (445 grams). Although the fixed-focal-length lens (35mm lens equiv) is sharp, bright (f/2 widest aperture), and compact, its lack of zoom and no image stabilization restricts creative freedom. As a professional photographer you can work around the limitations of any camera, but Sony RX100 and NEX-6 give better performance and quality for the money in this size range. Note also the world’s smallest full-frame sensor camera: Sony Cyber-Shot DSC-RX1 compact digital (17 oz with fixed 35mm f/2 lens, 24mp, 3″ LCD, costly add-on optical viewfinder/rangefinder). Thank you for your great reply. I’ve had a good in depth look at the cameras you’ve recommended. Seems I have a lot to consider. My main gripe with the Sony [NEX 6] is that it still isn’t pocketable, but neither is it one to wear over your shoulder or around the neck. Silly gripe but I’ve tested them all here in the uk and also they are rather pricey. I can get the x100 for around £600. Sony [RX100] looks amazing. I really need to get my hands on one. Also.. I forgot to mention that the [lack of] viewfinder is a deal breaker. But the oly is way out of my price range. Olympus PEN may be more in my reach. – Of those cameras that you listed, you may most enjoy Canon PowerShot SX40 HS (21 ounces, 12 mp, 2.7″ screen, 24-840mm equivalent, 35x zoom range). But I recommend a superior camera within the same superzoom style and price range: Panasonic Lumix DMC-FZ150 (19 oz with lens, 24x superzoom lens, 25-600mm equiv, 3″ screen) for wildlife & landscapes. This style of camera is more flexible and easier to use (but slower to autofocus on active subjects like children or wildlife) than a traditional DSLR style cameras from Canon or Nikon. Or upgrade to newer Panasonic FZ200 (2012). – Note that pocket-sized cameras can capture sufficient quality for small prints and web posting. You don’t necessarily need a camera as bulky as the above, especially if you are accustomed to your current 5 ounce Kodak M1033 (3x zoom, 10mp, 3″ LCD, 2008). You can jump in features above your current camera and still keep it pocket sized as follows: Canon PowerShot SX260 HS (2012, 8 oz, with GPS, 25-500mm equiv superzoom lens, 3-inch screen) (or Canon PowerShot SX240 saves money without GPS or touchscreen). Have a great trip! – In your target price range 300-450 British pounds (US$500-700), you can beat Canon G12 image quality by getting a newer Sony DSC-RX100, the world’s best pocket-sized camera (8.5 oz, 28-100mm equivalent lens, f/1.8-4.9, sharp 20mp “1-inch-size” sensor, autofocus as fast as 0.13 sec, sharper and brighter LCD, but no viewfinder). The extra sharp resolution of the RX100’s larger sensor can easily make up for the camera’s smaller zoom range by cropping images as needed. – Or in this price range, for a compact travel camera with a good interchangeable lens system with a larger sensor, try a Panasonic Lumix DMC-GF5X Micro 4/3 camera (9.4 oz body) with unusually compact Lumix G X Vario PZ 14-42mm F3.5-5.6 ASPH OIS lens (3.4 oz). If you want a viewfinder, upgrade to a Panasonic G5, G3, or GH2. An even more expensive upgrade ($1600) would be the excellent weather-sealed Olympus OM-D EM-5 with sealed M.ZUIKO DIGITAL ED 12-50mm f/3.5-6.3 EZ lens, new in 2012, one of the best-ever portable travel cameras. Dominic replied: Fantastic thanks very much, the Panasonic Lumix was on my short list but without any knowledge of how good it would be for travel. I’ve had several friends who’ve been around that part of the world with the Sony NEX series, I think specifically the 5N, have they been lucky or is it a solid camera? How does it rank up to the Panasonic? Also any suggestions on what king of bag to purchase, is it worth getting any specific kind of camera bag? Tom replied: The excellent Sony NEX-5N has a 16mp sensor which is similar quality to Panasonic GF5X, and both beat the image quality of the bulkier Nikon D3100. (NEX-5N is less sharp than Olympus OM-D, which is exceeded by Nikon D3200 sharpness, and NEX-7 is sharpest of all.) After buying a particular camera, bring it to your local camera store to find a bag that fits camera plus extra batteries. These days finding a desirable chest-harness for a bag is difficult. But most bags come with a usable shoulder strap. A bag with built-in rain cover is helpful (or a plastic shopping bag can easily suffice by tying on with its handles, using a twist-tie to keep bag from flying away). Look for a bag with convenient quick access to the camera under a variety of travel conditions. Tina responded: Thanks for the information. I will check it out. Out of interest what do you think about the Sony Nex 5 or 7 or the Olymus Pen range? The fact that they are so compact really appeals to me. -The Sony Alpha NEX-7 (13 oz) with Sony E-Mount 18-200 lens (18.5 oz) is now my main travel camera! Compared to all mirrorless & APS-C DSLR cameras as of August 2012, NEX-7 has sharpest real image resolution (24mp) and focuses fast. NEX-7 easily beats a NEX-5. – If you are concerned about weather-proofing, consider the great new Olympus OM-D E-M5 Micro Four Thirds Digital Camera (15 oz, 16 megapixels) with weather-sealed M.ZUIKO DIGITAL ED 12-50 mm f/3.5-6.3 EZ lens (7.5 oz), which has image quality almost as good as Sony NEX-7 yet lenses which are more compact (due to physically smaller sensor). Get a longer travel telephoto 14-150mm, which currently isn’t available in weatherproof version. This new 2012 Olympus OM-D is superior to Olympus PEN-3 or earlier PEN. – Getting a Panasonic G Series camera might save money: Panasonic Lumix DMC-G3 camera (2011, 15 oz body) has lower price, fully-articulated touch screen, good EVF, built-in flash, slightly older sensor. For travel, get an excellent Panasonic Lumix G Vario HD 14-140mm f/4.0-5.8 ASPH./MEGA O.I.S. lens (16 oz, 6.35 x 8.38 cm). The weight is similar to NEX-7 system but lens is more compact. For the lightest, smallest system with a sensor superior to the Panasonic G3, get similar features in a smaller body, with improved 2012 sensor: Panasonic Lumix DMC-GF5X Micro 4/3 Camera (9.4 oz body). These Panasonics are better than Olympus PEN series in overall features and sharpness. Nikon D3200 or D3100 is the best value for an excellent DSLR, as described above. A one-lens solution is very convenient: Nikon 18-200mm VR II (or new Nikon 18-300mm is bigger and heavier but covers more range). Or swapping the two excellent Nikon “kit lenses” covers that zoom range with the same quality and saves money. If you want to spend for the best, get a Sony NEX-7 with Sony E-Mount 18-200 f3.5-6.3 OSS lens (my new travel camera as of July 2012). For a cheaper option that also captures excellent quality rivaling a Nikon D3100, go for a Panasonic G series mirrorless camera (GF5X, G5, or G3) with 14-140mm travel lens and electronic viewfinder. Option B. Or, for better quality images and quicker autofocus, try a heavier DSLR style camera with interchangeable lenses. Sony can be a good value DSLR camera because image stabilization is built into the camera body, so lenses can be cheaper than Nikon or Canon. Find a good value used Sony Alpha 550 camera with “kit lens” (2009), or a Sony SLT Alpha A33 with 18-55mm kit lens (2010, with great new translucent mirror technology). Add this sharp telephoto lens for wildlife: Sony 75-300mm f/4.5-5.6 Compact Super Telephoto Zoom Lens for Sony Alpha. See also my page discussing telephoto lenses.